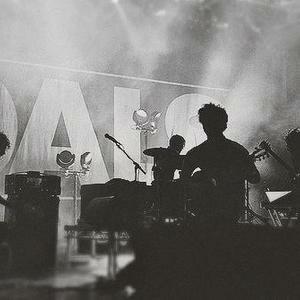 Foals are an indie rock/math rock band which formed in Oxford, England in 2005. They are currently signed to Transgressive Records in the United Kingdom and Sub Pop in the United States. They released their debut album Antidotes on 24 March 2008 in the UK, and 8 April 2008 in the US. The band's second album, Total Life Forever, was released on 10 May 2010. Foals also released a mixtape named Tapes in July 2012 for !K7 Records. On November 2012, as an advance off their third album Holy Fire (February 2013), the band released "Inhaler". The lead singer of Youthmovies, Andrew Mears, originally formed the band Foals, playing as guitarist and lead vocalist. He was present on the band's debut 7" single "Try This On Your Piano/Look at My Furrows of Worry", but left shortly afterwards to concentrate on Youthmovies' debut album Good Nature. Jack Bevan, Lina Simon and Yannis Philippakis were originally in cult math rock band The Edmund Fitzgerald, which did not gain much media interest. The group disbanded, claiming that things had become "too serious" and that they wanted to have more "fun making their music". Walter Gervers and Jimmy Smith were part of a small Oxford band called Face Meets Grill. They met at and formed the band from members of Abingdon Boys School. They played gigs in and around Oxford, and recorded an EP in Hull. After playing Truck Festival in 2004 they separated to follow different paths and careers. Guitarist Jimmy Smith is the only one of the band members to have completed his degree, at Hull University: each of the band members quit their respective universities when the band signed to Transgressive Records by Ben Mackereth. The band likes to be self-sufficient, so the music videos & the photography is done by their friend Dave Ma and all of the artwork (excluding cover art of Total Life Forever) is also done by their friend Tinhead.